The Chevrolet Volt extended-range electric vehicle is expected to achieve city fuel economy of at least 230 miles per gallon, based on development testing using a draft EPA federal fuel economy methodology for labeling for plug-in electric vehicles. 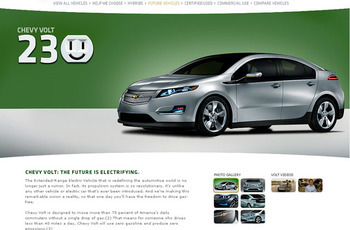 The Volt, which is scheduled to start production in late 2010 as a 2011 model, is expected to travel up to 40 miles on electricity from a single battery charge and be able to extend its overall range to more than 300 miles with its flex fuel-powered engine-generator. According to U.S. Department of Transportation data, nearly eight of 10 Americans commute fewer than 40 miles a day http://tinyurl.com/U-S-DOTStudy . ”The key to high-mileage performance is for a Volt driver to plug into the electric grid at least once each day,”Henderson said. Volt drivers' actual gas-free mileage will vary depending on how far they travel and other factors, such as how much cargo or how many passengers they carry and how much the air conditioner or other accessories are used. Based on the results of unofficial development testing of pre-production prototypes, the Volt has achieved 40 miles of electric-only, petroleum-free driving in both EPA city and highway test cycles. Under the new methodology being developed, EPA weights plug-in electric vehicles as traveling more city miles than highway miles on only electricity. The EPA methodology uses kilowatt hours per 100 miles traveled to define the electrical efficiency of plug-ins. 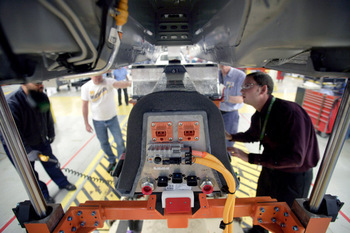 Applying EPA's methodology, GM expects the Volt to consume as little as 25 kilowatt hours per 100 miles in city driving. At the U.S. average cost of electricity (approximately 11 cents per kWh), a typical Volt driver would pay about $2.75 for electricity to travel 100 miles, or less than 3 cents per mile. The Chevrolet Volt uses grid electricity as its primary source of energy to propel the car. There are two modes of operation: Electric and Extended-Range. 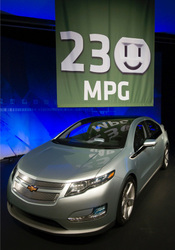 In electric mode, the Volt will not use gasoline or produce tailpipe emissions when driving. During this primary mode of operation, the Volt is powered by electrical energy stored in its 16 kWh lithium-ion battery pack. When the battery reaches a minimum state of charge, the Volt automatically switches to Extended-Range mode. In this secondary mode of operation, an engine-generator produces electricity to power the vehicle. The energy stored in the battery supplements the engine-generator when additional power is needed during heavy accelerations or on steep inclines. 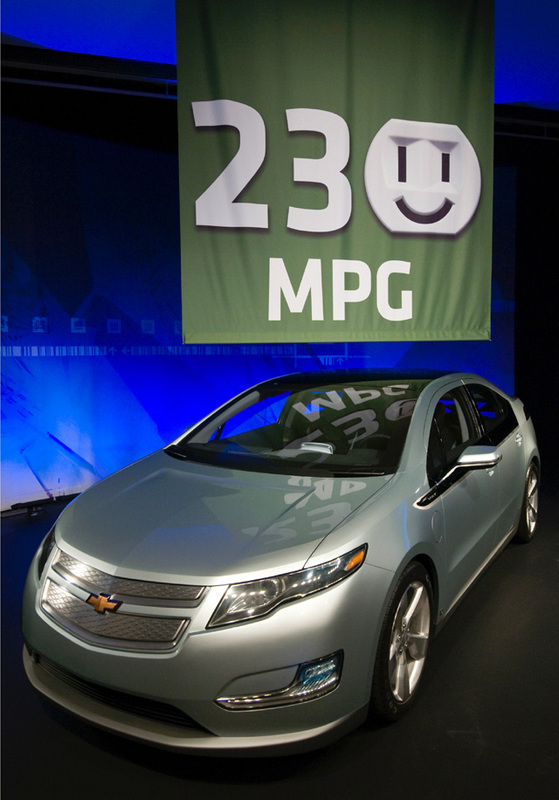 ”The 230 city mpg number is a great indication of the capabilities of the Volt's electric propulsion system and its ability to displace gasoline," said Frank Weber, global vehicle line executive for the Volt. "Actual testing with production vehicles will occur next year closer to vehicle launch. However, we are very encouraged by this development, and we also think that it is important to continue to share our findings in real time, as we have with other aspects of the Volt's development.” "